Two nights ago, Richard LeGuin was shivering under a Houston bridge. On Thanksgiving Day, he was safe and sound inside the George R. Brown Convention Center. 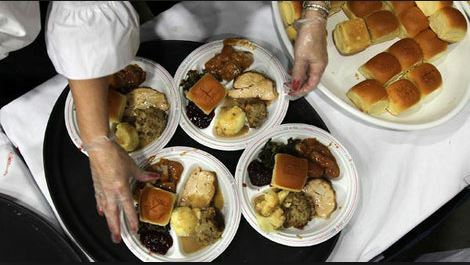 “Whole lot better in here,” LeGuin quipped between bites of turkey at the Super Feast, one of the largest outpourings of support to low-income residents in the Gulf Coast area. Nevach Vasquez let loose a little squeal of delight when volunteers at the Christmas Eve Super Feast handed her a new Barbie doll – a toy she clung to tightly as if worried someone would take it away. “She looks just like you,” the volunteer said, pointing out that both the 7-year old and the doll had curly hair. Nevah nodded and smiles, her ringlets bobbing up ad down as she walked back to her grandfather, Guy Vasquez, proudly displaying all the toys she had received: a doll, a hula hoop, a vinyl figurine she could color. Guy beamed back at the girl. “These will be the only gifts she received this Christmas. It’s been a hard year,” the 49-year old said. “We have no money at all,” he said through mouthfuls of steaming turkey, corn and rice.